Inner-City Arts is excited to debut a new series presented by The Rosenthal Theater called LA SPEAKS, a gathering and platform for voices in our community. 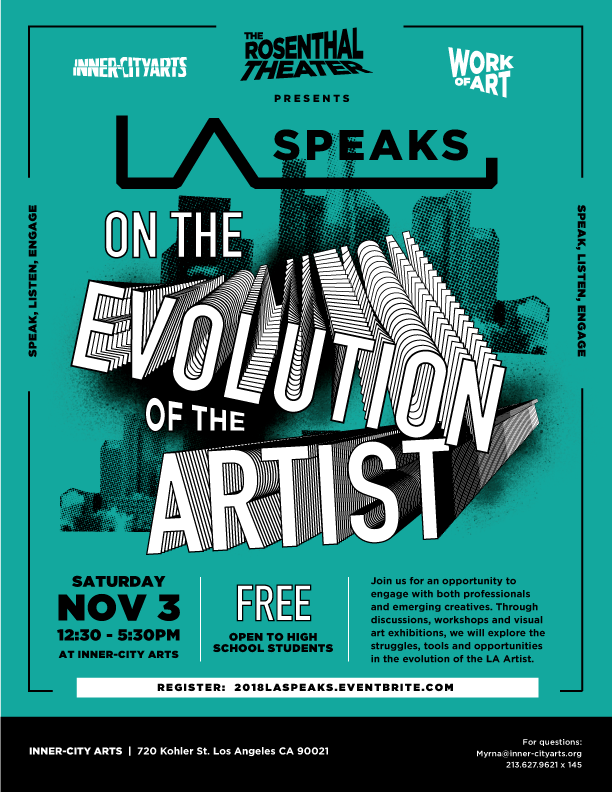 In our first installment, LA SPEAKS: On the Evolution of the Artist, we welcome teen participants to engage with professionals and emerging creatives on November 3, 2018 on the Inner-City Arts campus. This one-day event, curated by teens for teens, invites high schoolers from across Los Angeles to speak, listen and engage with both professional and emerging creatives and will feature inspirational keynotes, interactive workshops, panel discussions, and a gallery and reception. In association with Inner-City Arts’ Work of Art teen leadership group, LA SPEAKS: On the Evolution of the Artist offers a space for high schoolers to create community with likeminded young creatives and leaders around the struggles, tools and opportunities in the evolution of the LA Creative. LA SPEAKS will guide teens through building a business model, making a mark in a saturated creative market, and connecting the dots between an emerging to established career in the arts. After an afternoon of discussions and workshops, there will be a gallery show and reception featuring a collection of work by teen and professional LA artists shown side by side. Additional participating artists and creatives to be announced.